We supply belt feeders in several sizes and designs according to specific project. 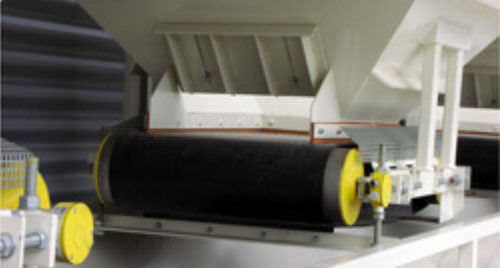 Designed for volumetric dosing or for dosing aggregates to a weigh belt. The belt feeder is assembled on a U-frame equipped with a drive pulley. It can be delivered with either a shaft-mounted gearbox or a drum motor. The belt feeder is delivered complete with rubber belt, rollers, galvanized inlet funnel with flange for fitting on silo outlet. The inlet funnel is equipped with a gate for control of the outlet capacity, edge rails and empty level reporter.